"Lots of Cool & Awesome - Birthday Party Crafts!" Here in Birthday Crafts you will find lots of creative and fun things for your kids birthday party. We have lots of fun kids crafts ideas to make your girls birthday party a success. Below are some fun Birthday party crafts ideas. If you have not hade a look at our Party Games have a look a those ideas too, there you will find lots of fun party games. If you dont find the Craft you are looking for have a look at this Birthday Party Crafts website they have lots of cool low priced crafts. Also, dont forget to Party It Forward, do you know of a great CRAFT IDEA you would like to share with us and other parents, do you have pictures, please feel free to Party It Forward. We and others will love to hear from you. It's nice when parents around the world contribute in helping each other find FREE craft Ideas. Now scroll down and have a look at our Birthday party crafts ideas and don't forget to have a look at our Christmas Crafts and Halloween Crafts too. Let the girls make their own Princess Body Glitter or Fairy dust. You will need: One very small container for each girl (dollar store), polyester glitter- choose girly colours, this is available at most craft stores, and aloe gel. Fill the small containers 1/4 full with aloe gel. Put a small amount of glitter in the container, mix with a plastic stick. Add more gel if needed if not close the lid. Decorate the container with princess tickers, gel pens etc. Let the girls in the party make royal crowns, it's lots of fun and it goes hand in hand with a Princess Birthday Party. You will need: A4 tracing paper and pencil, strip of gold card, 12.5cm x 60cm, PVA glue, hologram film, 25mm x 60cm, 2 stripes of gold card (4cm x 33cm), paper fastener and paperclips, cotton wool, purple felt, black paint and fine brush, scissors, large round plate, and stick on jewellery (which can be glued). 1. In the back of the gold card trace our crown template, then repeat and cut out the whole strip. 2. Now you have to glue the hologram film along the base. Also glue the jewellery along the hologram film etc. Glue the two ends (of the gold card) around your head, use paperclips to help you hold in place the "grown". 3. Glue the ends of the short gold stripes, around the crown in a X. Make a mark halfway (then push a paper fastener through, in the middle of the X. Hold the gold stripes in place with paperclips, while they dry. 5. With a round dinner plate trace a round form and cut out a circle of purple felt. Make tiny snips around the outside of the circle. Put the purple felt inside the crown and glue the inner brim (crown, bit by bit), along the folded edges. 6. Almost done, cut a strip of cotton wool (4cm), glue it to the bottom edge of the crown, paint black spots (3cm apart from each other) on top of the cotton wool. Much easier done then the Royal Crown, you will need: strip of gold card, 12.5cm x 60cm, PVA glue, 2 stripes of gold card (4cm x 33cm), paper fastener, zig-zag scissors, large round plate, and stick on jewellery (which can be glued). Put a round dinner plate on top of the gold card, then draw a round form. Cut the gold card in half and glue it to a headband. Use shiny foil and stick on jewellery to decorate the tiara. Ask guests to bring a plain white T-shirt that can be painted. Give each kid a set of paintbrushes and let them paint their own T-shirt with glow in the dark paint. While the paint is drying on the T-shirts stick glow in the dark stickers all over the T-shirt for more effect. When the T-shirts are dry take the kids into a dark room- they will see their T-shirt glow in the dark. Let the girls at the party decorate their own handkerchief. 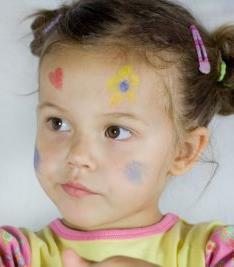 Provide the kids with a blank handkerchief and have them paint and decorate their handkerchief with crayons. The kids have to press the crayons hard into the cloth, the colours are better seen at the end. When the kids are done place a damp cloth between the handkerchief to fix the colours. You will need dried pasta shapes, acrylic paint-pink, purple, blue, gold, silver etc, cocktail stick, empty egg box, and an coloured cord. Let the girls paint the pasta in different colours. After painting the macaroni, they have to put a cocktail stick on the ends of all the macaroni and stick them to the empty cardboard egg box, to let the macaroni dry. Let the girls thread the macaroni until all their macaronis are threaded. Knot the two ends of the thread together, and voila you have a colourful macaroni necklace. You will need a big roll of wrapping paper, pencil, scissors, crayons, fabric and buttons. Provide each child with a child sized length of wrapping paper. Each child has to lie down on the paper and another child has to trace the outside of the child's body with a pen. After helping each other trace each other the kids have to cut out their form. Now they can start to draw their facial features and clothing. Using fabric, buttons etc they can decorate their doubles. You will need 2-3 big bowls, old newspaper, water, spoon, straws, white paper, washing up liquid, ready mixed paints-pink, blue, purple, orange etc. Pick girlie colours. Start by covering a table with old newspapers as this is a messy project. Start by mixing together 1/2 cup water, 1-2 tablespoons of pink paint, and 1/2 tablespoon washing up liquid in a bowl. Mix together the same quantities in the other bowls, but choose another colour. So you have 3 bowls with different colours. With the help of a straw, blow to make bubbles, blow until there are lots of bubbles, (to make more bubbles add more washing up liquid). Put a piece of white paper on top of the bubbles and keep it there until several bubbles have popped. Now move on to the next bowl with different colour, and repeat what you just did, (if the colour is too faint add more paint to the mixture). Leave the paper to dry. You have just made your own wrapping paper, with different bubble looking colours. You will need a small sponge (washing up sponge), gold paint, paper, lila or red tissue paper. Fold a small paper in half, draw a half shape heart, cut the shape out. You will use the heart template to make heart looking wrapping paper. Put the gold paint in a bucket. Put the card with the heart shape hole on top of the tissue paper, put gold paint on the tab of the sponge. Gently dab the sponge over the hole. Always hold the card against the tissue paper. Do this lots of times all over the tissue paper and let it dry. You will have a good looking tissue paper with heart shapes on it. Ask all guest to bring a clean tube of empty crisp. Let the kids rub the tube with sandpaper, paint it all blue, pink, purple or black. When the tube is dry is time to decorate it. Gently put some glue on the tube, making a form or an image. Sprinkle gold and silver glitter over the glue. Stick small stars or stick on jewellery on the tube. You will need empty round jars and lids, glycerine, black relief outliner glass paint, glass paint- green, orange and red etc, paintbrush, blue glitter. Start by turning the jar upside down, with the black relief paint draw the outline of a fish, seaweed etc. Leave it to dry. Now colour the fish, seaweed etc with the glass paints and brush. Leave it to dry. Fill the jar with water, add some glitter and few drops of glycerine. Put glue around the lid and put it on the jar, gently. Leave it to dry for 6-7 hours. You will need a bag of colourful beads, spray varnish, cocktail sticks, empty cardboard egg box, glue, and old mirror. Put the beads inside of a cocktail stick, stick the cocktail stick to an empty cardboard egg box. Spray the beads with varnish, let it dry. Brush glue on the beads and stick them around the boarder of the mirror. You will need girly shaped cookie cutters -butterfly, heart, high heal, purse etc, acrylic paint, cocktail stick, baking sheet, lavender essential oil, rolling pin, pink and purple ribbon, and salt dough mixture. Start by making the salt dough, days before the party, you will need: 100g flour, 50g salt, 1tsp cooking oil, 80ml water, mixing bowl, board. Mix together the salt, flour and oil using your finger tips. Add a bit of water and mix it very well until you have a smooth and thick dough that sticks to the sides of the bowl. Sprinkle some flour on the board and knead the dough, make a smooth lump. Put the dough in a container in the fridge for some days. When time to bake, bake in a preheated oven at 120 °C for approximately 3 hours until firm, can be more ore less, make sure it's hard. Give each girl a lump of dough. Tell the girls they have to roll it out to about 2cm in thickness. Using the girly cookie cutters, let the girls cut out shapes out of the dough. Make a hole at the top of each shape with the help of a toothpick. Place the figures on a baking sheet and bake as instructions above. When done take out and let it cool. Now paint the shapes leaving a small square on the back unpainted. Thread a small ribbon through the hole and knot it at the back. Add a few drops of lavender essential oil to the unpainted square area. You will need an empty cheese bow with lid, purple felt, glue, brush, pink acrylic paint, big and small pearls in different colours or beads. Put the lid on top of the purple felt, draw around the lid. Cut the circle out and glue it inside the lid. Repeat and stick onto the base of the box. Cut out some long stripes of felt and glue it around the inside of the box. So the inside of the box is all purple. Paint the outside of the box and the outside of the lid with the pink acrylic paint. Let it dry. Glue lots of pearls in different colours on top of the lid. Glue the pearls on top of each other, so it looks like a mini mountain of pearls. Lots of fun, give each girl blunt needles threaded with sting, provide them with bowls of cheerio's, liquorice, raisings, olives, dried fruits, mini marshmallows, popcorn etc anything stringable. Provide the girls with a colourful cord, along with decorative flowers, letters and stickers, (you can buy this at party stores). Let the girls decorate their bracelets with the materials provided. Make sweet bread dough before the party. The day of the party give each girl a lump of dough. With the help of girlie cookie cutters let the girls cut out different forms. Bake the bread and let it cool. Provide the girls with pink, blue and white frosting, let them frost their bread. The girls will have lots of fun and this sweet bread is really yummy to eat.